There is a hole in the bottom of the JOIDES Resolution. And not a small one – it’s 22 feet wide. The hole is in the centre of the ship, directly below the derrick. 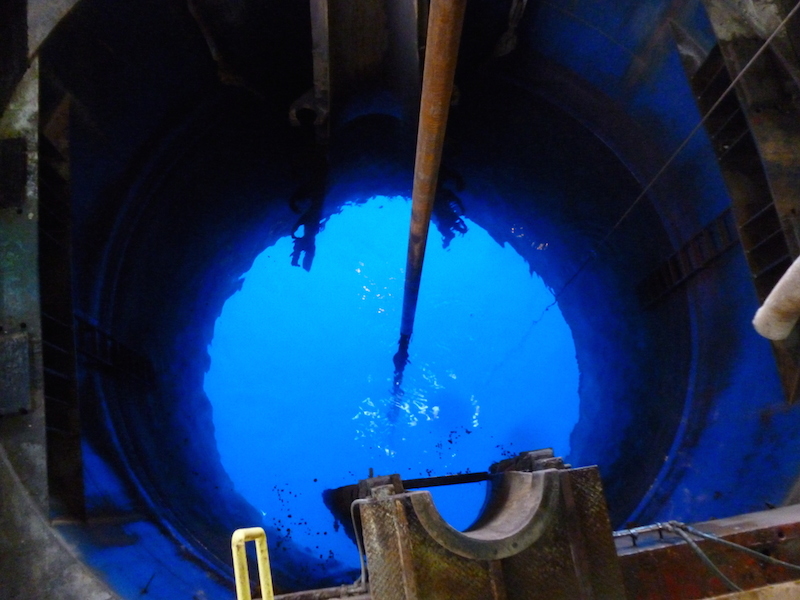 It’s called a “moon pool” and is an essential part of our drilling operations. The drill pipe hangs from the top of the derrick, passes through this hole, into the ocean and all the way down to the seafloor. So why doesn’t water rush in and sink the ship? A strictly scientific answer would involve a complicated explanation of buoyancy, water displacement and Archimedes’ Principle. So I asked JR Operations Superintendent Steve Midgley how he’d explain this concept to a 10 year old. Simple, he replied, just think of an inner tube. It’s got a hole in the middle but doesn’t sink. Even if you push it down, it won’t sink. In fact, it will probably pop back up and hit you in the face! ship. Simply put, water will not enter because the sides of the moon pool extend up inside the ship well above the waterline. Also, the moon pool doors are closed whenever the ship is moving or in rough seas. On rare occasions, the moon pool is fully opened to lower or raise certain drilling tools to and from the seafloor. On this expedition, we were lucky to see it open a few times when they installed the re-entry cone and camera system. At night there’s not much to see, but in the light of day, the moon pool “glows” a deep blue and peering into this seemingly infinite abyss is mesmerizing.